There has never been a time when artistic and architectural creation advanced as quickly as in ancient Greece. Styles and subjects changed from small, abstract sculpture to realistic and idealized reprepresentations. They knew of the Egyptian style of representing the human form, but the Greek's philosophy for capturing an ideal human form developed far beyond that. Ancient Greece as discussed here surrounded the Aegean Sea, and was composed of a main peninsula called Macedonia and many smaller islands, the largest being Crete. 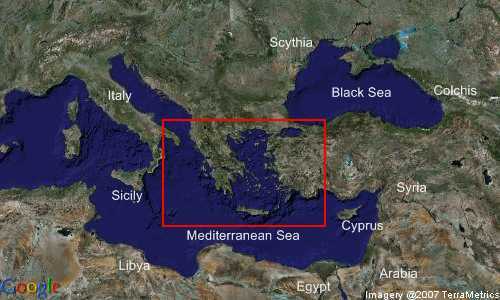 As you can see from the satellite photo, the geographic area that makes up Greece bordered closely with the ancient Persian empire and was a short distance over the Mediterranean Sea from Egypt. Provide contextual understanding of these early civilizations that surrounded the ancient Aegean Sea. The ancient Greek Herodotus was one of the first great historians, and he chronicled the Peloponnesian War. His work, among other surviving texts, provide historians with a thorough yet biased account of life during ancient Greek times. The fact that Greek as a language has survived through our modern times means that Greek histories have formed many of our modern opinions of these times. In discussing the context of the period, we will begin by focusing on the ancient Greek city-states and their shift toward a more cohesive Greek empire following the Peloponnesian War, and the subsequent expansion of the Greek nation under Alexander the Great. Also important to the understanding of Greek art is their religious mythology that still captivates audiences today. The period of early Greece lasted from 3000 BCE to 1200 BCE, and was dominated by separated clans and city-states. The threat of invasion by neighboring empires pushed certain cultures, specifically the early Mycenaens on the mainland, to build monumental fortress structures to protect their societies. It is believed that the ancient King Agamemnon han once ruled this civilization. On the large island of Crete, the Minoan culture flourished under the rule of King Minos, who was thought to have overseen a massive and complex labyrinth containing the legendary Minotaur. Lastly, there is the small islands of the Cyclades, where archaeologists have found a few structures that were naturally fortified within the Aegean Sea. Following the Peloponnesian War, Greek city-states came together under one formal civilization, the Hellenes, through alliances, a rough democratic system, and the ceremonial Olympic games, which began in in 776 BCE. The Greek kingdom later expanded following the conquests of Alexander the Great to include the entire Persian Empire and Egypt, even though he quickly split those empires following his expansion so that each was overseen by Alexander the Great's former generals. After years of prosperity, the Hellenes were eventually absorbed by the growing Roman Empire, in 30 BCE. The concept of a democracy in Hellene culture was not as we know it today. Democracy was for few--namely, men who owned land. Slavery was regarded as natural and beneficial, and the life and experiences of few females were recorded during this era. Many democratic decisions were also decided through military might rather than the democratic process. The Greek religion was dominated by a pantheon of gods and goddesses that took the form of men and women. These gods were often described in stories as moving among mortal humans, but were often distinguished by their perfect bodies. This concept often led the culture into what has been described as the "cult of the body beautiful" as Protagoras described humanity and humans were the "Measure of all things." As "a sound mind in a sound body" became an important concept, there was an extreme interest in physical exercise balancing the physical with the intellectual as many famous philosophers also stem from this culture. The Minoan artifacts found throughout Crete, and specifically the Palace of Konossos, describe a civilization that had many traditions and a specific style marked by colorful design and sea inspired forms. This civilization also demonstrates early appreciation for athleticism and the concepts of beauty and proportion. For further reading, refer to the Heilbrunn Timeline of Art History. Mycenaean artifacts demonstrate the power and constant threat of invasion that this culture faced. The land-connected geography, unlike the island cultures of the Cyclides and Minos, forced the development of large citadels and depictions of warriors and heroic feats. Demonstrations of power are found in the depictions of large lion forms, monumental bee-hive tombs, and the extravagance of funerary masks. For more information, please refer to: Heilbrunn Timeline of Art History and the videos from SmartHistory. The Geometric period in early Helenic art is demonstrated in the 8th century BCE with artistic artifacts that are dominated by geometric patterning and stylized human forms. To gain a broader understanding of this period, please refer to the Helibrunn Timeline's Article: Geometric Art in Ancient Greece. The Greeks also had a fascination with the Orient, exotic elements that derive from foreign and fantastic influences. The Corinthians' inventions of new ceramic techniques allowed for the Helenaes to produce exquisitely decorated ceramic artifacts. Early artifacts from this era and style of art are often referred to as "Daedalic," which is a term borrowed from the legend of Daedalus who was an artist who seems to have worked in Egypt, and he brought the influence of Egyptian art, architecture, and technology to the Greeks. 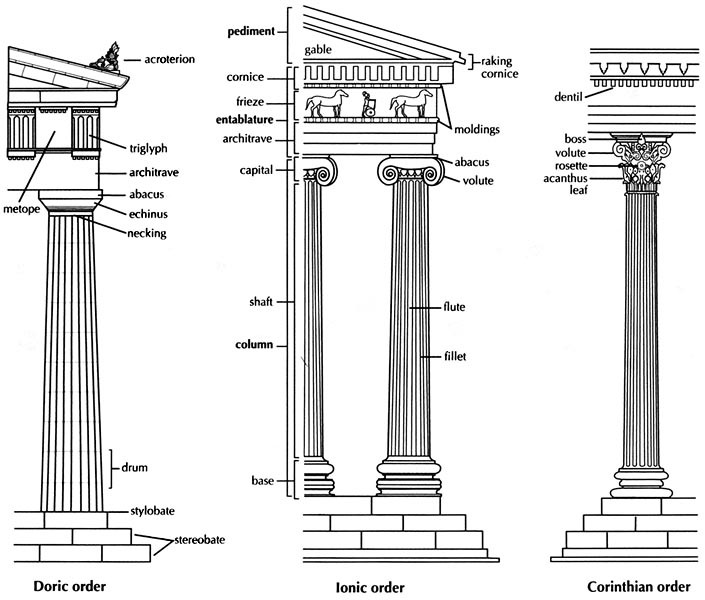 The Archaic period and style is defined by large, life-size sculptures and architectural temples began to be built in a style that some consider to be the precursor or source for the Doric order of architectural proportion. Ceramic artifacts and decoration continued to be used through this time as artists begin to develop more naturalistic styles and methods for depicting narrative. Stylistically, the human form begins to become more naturalized, however there are still issues with anatomy and proportion. The facial features tend to remain stylized with almond-shaped eyes and what has been referred to as an enigmatic "archaic smile." Within architectural triangular pediments, sculptors often diminished the scale of figures and other forms to cope with the constraints of the geometric space. For more information, please read "Greek art in the Archaic Period" from the Heilbrunn Timeline of Art History and see the videos on SmartHistory. This period and style of Greek art begins with the Helenistic defeat of King Xerxes and the Persians in the naval battle at Salamis. Following this war, the Greek city states saw themselves as a different from the Asian "barbarians" and heralded the triumph of reason and law. The classical style demonstrated an artistic development toward new ideals of proportion, order, and beauty. Figures began to reflect a deep understanding of anatomical form, temples became more elegant and accomplished in both proportion and building techniques, and a sense of naturalism and motion was captured within many artifacts. The development of Polykleitos' Doryphoros (Spear Bearer) represents a break with the Archaic style as artists moved towards the Classical era in Greek art. This transition coincides with the independence of the Greek states from other influences such as the Egyptians. For more on the topic please read "The Art of Classical Greece" from Heilbrunn Timeline of Art History, and view the videos on Early Classical and High Classical from SmartHistory. The Late Classical era was one of strife, political upheaval, plague, and still more pressure from Persia. The period ends with the assassination of Philip II and his succession by Alexander the Great who subsequently led a campaign against Persia. He ultimately conquered Persia, Egypt, and Mesopotamia, with lands all the way to the Indus Valley. In the arts, Praxiteles introduces a more fluid depiction of motion with curvilinear stances that demonstrate an ease to the pose. Other artists such as Lysippos produce relaxed naturalism demonstrating both idealization and realism in the poses that they sculpt. The Hellenistic age followed Alexander the Great's conquests. Athens became a cultural center and the Greeks were left to pursue thought and art in an age of peace. The result is a progression of artistic form to heightened dramatic poses and increased story telling and naturalism. Clothing clings to the form as if wet and blown in the wind, and poses are exaggerated to make the static forms appear alive. For more on the Hellenistic age, please refer to the following articles: "Art of the Hellenistic Age," "Intellectual Pursuits of the Hellenistic Age" from Heilbrunn Timeline of Art History. and the videos from SmartHistory. Aphrodite (Venus de Milo): From the Louvre, Paris. This topic was discussed at length in the "How Art Made the World" episode: "More Human Than Human" (Link set to the part about Greece). Images such as the Battle of Issus depict actual battles. Other artifacts, such as the Altar of Zeus at Pergamon similarly describe the topic of conquest as it pays homage to the victory over the Gauls both directly and indirectly though the metaphoric depiction of the victory of the gods over the titans. Many of the artifacts that have survived from ancient Greece demonstrate the power of the empire and often the victories of one city-state over another or the entire Hellenic nation over their foes. Religious beliefs shaped many of the artifacts we see. Many of the subjects represent ancient gods and mythological stories, while temples house the gods on Earth. Though there are many direct references to religion, one must also not forget that the demonstration of perfection in the human form represents an extension of the belief that gods take on human form. Sculptures of athletes and other idealized human forms thus are extensions of this "cult of the body beautiful."